This May, we’re continuing to celebrate and spread word of Vol. 2’s release across North America. The weekend of May 19-20, Andrew Carl (editor; writer of “Icarus”, “Daphne”, & “Heracles”) will be travelling up to Canada for VanCAF: Vancouver Comic Arts Festival. A couple other OUATM creators will be there, too: the incredible Ronald Wimberly (writer/artist, “Theseus and Metrotaurus”) and Farel Dalrymple (cover artist)! Find them all in VanCAF’s “Gym” room (tables M3, H1, & H12). A week later, Amalgam Comics & Coffeehouse in Philadelphia will host Chris Stevens (editor; writer of “A Heavy Stone for All the Peoples”), Andrea Tsurumi (writer/artist, “Away Mission”), Mike Sgier (writer/artist, “Andromeda”), and renowned science fiction author Michael Swanwick (writer, “The Long Bow”). Rob Woods (writer/artist of Vol. 1’s “The Boy Who Cried Space Wolf”) will also be there to debut a killer new print to go with Vol. 2’s theme: Trojan War 3025. Given that Philly’s the birthplace of the OUATM series and family, expect to see a few more surprise guests show up, as well! 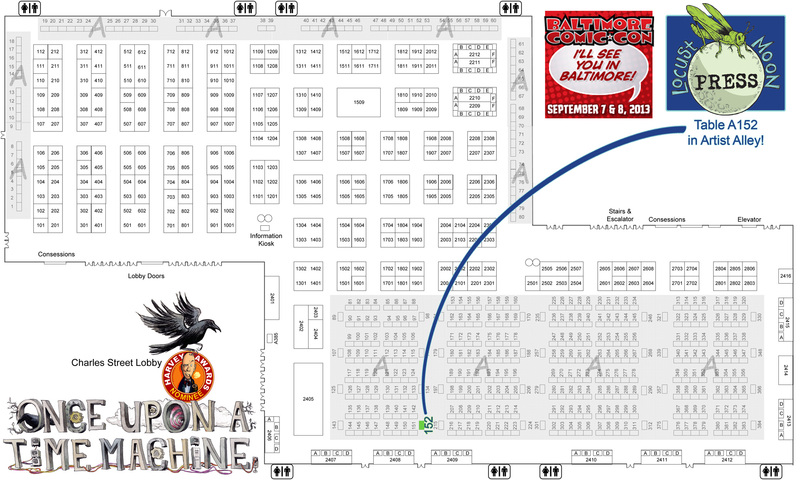 We’re here in Baltimore now for our first Baltimore Comic-Con! We’ve only heard great things about this show, and it looks like it’s going to be a great weekend. 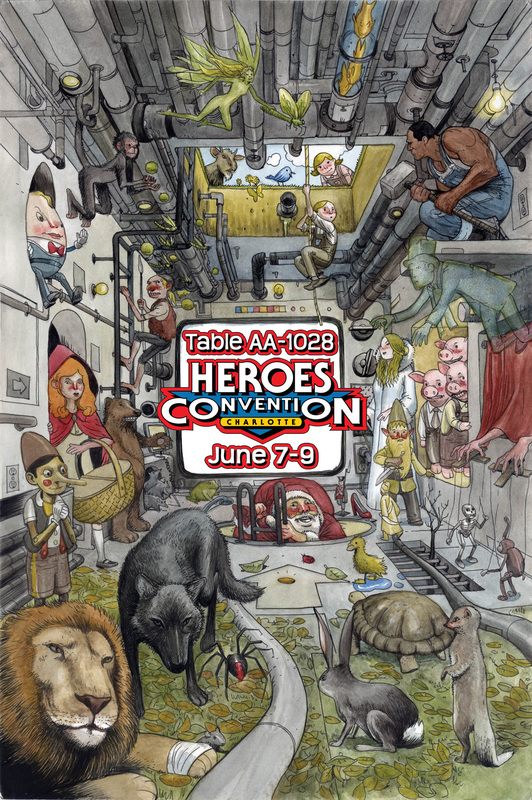 So this Saturday and Sunday, come find us (Andrew, Chris, and Josh) at Table A152 in Artist Alley, at the Baltimore Convention Center. We’ll have our usual set of Once Upon a Time Machine goodies, along with the latest addition to the Locust Moon Press catalog, Quarter Moon #1. We’ll also be carrying around a one-of-a-kind, top-secret portfolio of select finished art for our upcoming Little Nemo: Dream Another Dream anthology (printed at the book’s final printing size, 16″ x 21″!) – ask nicely, and we might let you take a peek! All photos in this post courtesy of Nate Prentice. Earlier in July, we visited the Haverford Township Free Library for their first-ever Comic Con. It was a small affair, held just 20 minutes away from the Locust Moon Comics retail store/home-base. And it was loads of fun. We had a blast talking to lots of kids and their parents, sketching, participating in panels, and even helping to judge a great kids’ art contest. Andrew Carl (Editor; Writer, “John Henry”), Chris Stevens (Producer; Writer, “The Boy Who Drew Cats”), David Tanh (Writer, “The Tea Garden Park Soapbox Grand Prix”), Dave Proch (Artist, “A.L.I.C.E.”), Rob Woods (“The Venusian Shepherd Boy Who Cried Space Wolf”), and Jimmy Comey (“Kid Yimage and the Really Big Hole”) all showed up for the festivities. Dave, Rob, and Jimmy spent nearly all day with pens in hand and noses to paper — they never stopped drawing! Jimmy joined a Superhero Sketch Showdown with Mike Townsend and the great Bob McLeod. Andrew and Chris sat on a panel with Matt Phelan and Dawn Griffin to discuss the process of of “Creators Creating” — from idea to publication and everything in between. Dave and Rob lead a “Let’s Draw!” workshop for the kids, with the help of Matt Phelan and Bob McLeod. And we’ve got video! We hope the Haverford Library Comic Con returns next year – because we’ll be there! Chris Stevens (Producer; Writer, “The Boy Who Drew Cats”) wrote up a fun journal of our trip down to Charlotte for HeroesCon over at the Locust Moon blog. It’s a nice read and covers a lot of the happenings and feelings of the convention and fine Southern city…and it’s also got pictures. You’re gonna want to see the pictures. Not to mention the videos! It may be a bit late, but Josh O’Neill over at the main Locust Moon blog wrote up a fun recap of our time in the Great White North for the wonderful Toronto Comic Arts Festival. The recap’s probably…50% about the food. I don’t see a problem with that. We’re going north! 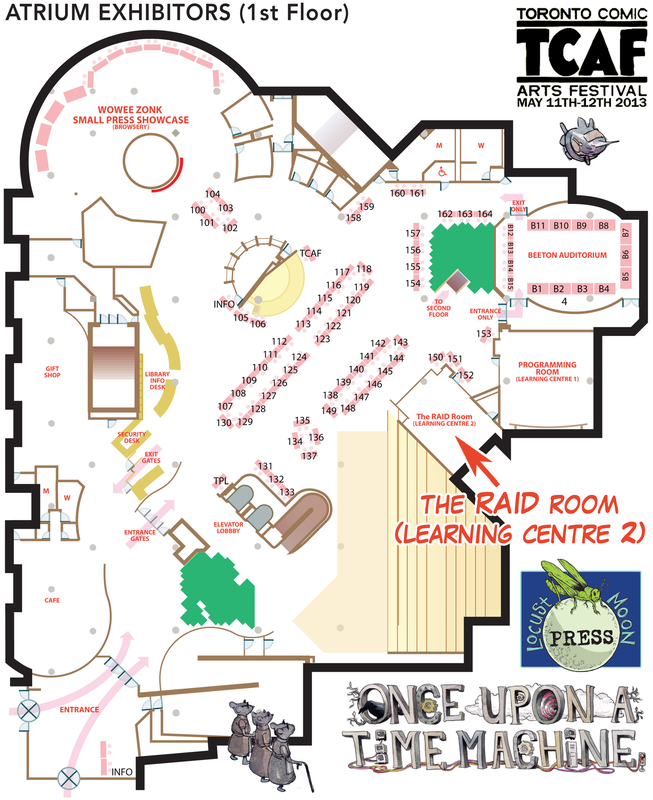 This weekend (May 11-12), we’ll be proud to represent Once Upon a Time Machine at Canada’s most beloved comics shindig, TCAF – The Toronto Comic Arts Festival! You’re also likely to find us scouring Toronto for the city’s best ramen, whenever we’re not busy at our table.